For the designer paper on this card I used the Clearance Rack DP - Sending Love. You can order this by clicking HERE. (I know I've said this about a million times already but if you wish to receive the preferred price you will need to set up an account before you add items to your shopping cart) You should feel the texture on this cardstock, absolutely fun and amazing. 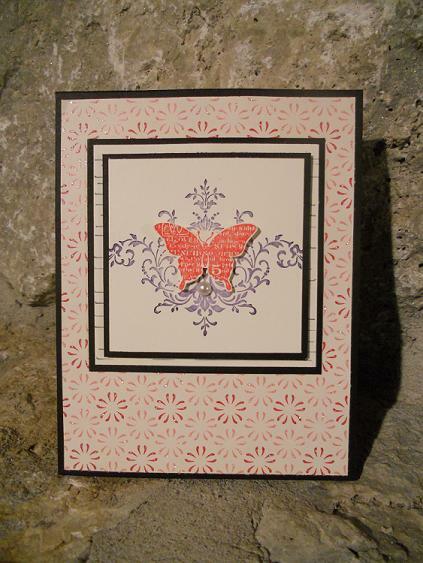 The image is from our Sale-A-Bration mini - Bliss stamp set. Isn't that image beautiful? I absolutely love it. If you would like to earn Sale-A-Bration products free simply place an order for $60.00 on-line through My Store or e-mail me. You will earn a free item from the Sale-A-Bration catalogue for EVERY $60.00 you purchase. (before s/h and tax) You must be a Canadian resident to order from me.